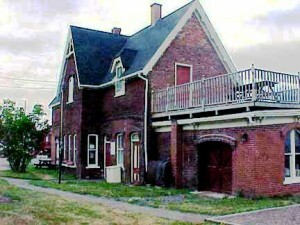 The Pugwash Train Station, built circa 1892, is a one-and-one-half storey red brick building located on the main road passing through Pugwash, Nova Scotia. It sits near the Pugwash River surrounded by a large paved parking area shared with a retail store. The building ceased serving as a station in the 1970s, and the tracks were removed in the 1990s. The building currently houses the local branch of the Cumberland Regional Library and the North Cumberland Historical Society. The building and property are included in the municipal designation.